If you are going to say good-bye to summer, then you are supposed to greet the fall in the prettiest way possible. With this cozy and inspirational season just around the corner, I bet you are actively digging your closet, recalling last fall’s trendy looks of yours and planning to supplement them with new fashionable ones. You will definitely announce about the lack of several garments in your closet without which you might not be able to create stunning looks in the upcoming fall. No wonder, we are excited to inform you about the comeback of the so challenging over-the-knee boots this fall, which are certain to find their place on a shelf in your shoe closet. It is worth taking a retrospective look at the process of over-the-knee boots becoming so widely used by fashion fans. Original OTK boots were far from being pieces of fashion. It was in the 15th century that men began using them on horseback as a protection means. Later in the 16th and 17th centuries they became popular among warriors as a piece of amour. And it was only in the early 20th century that OTK boots were first used by women but not as a piece of fashion, but as a look of the principal boy role in the pantomime theatre. In 1962 the fashion world could finally see the boots in Balenciaga’s fall collection, which was later followed by Yves Saint Laurent’s couture lineup. Since then, over-the-knee boots have been sought-after footwear options among ladies. Much to our delight, this fall promises to be rich in diverse, trendy over-the-knee boots and you are sure to choose a pair that will best correspond to your style and body type. Below we present 10 gorgeous over-the-knee boots for fall 2015, which might be your potential go-to footwear throughout the cold months to come. The famous French fashion house Chloe, which surely plays a leading role in many celebrities’ lives, has included in its fall 2015 ready-to-wear collection a pair of suede over-the-knee boots. The chocolate colored boots conjure up a feeling of comfort and calmness. Having heels of 1.5 inches and a small slit at the back top part, the boots make your motions perfectly quick in case you are hurrying somewhere. We hope you are smart enough to choose the boots, which are to go great with your denim jeans, throw-on-and-go dresses, as well as your mini and midi skirts. As for your bag, take a piece of advice from us to carry a tonal cross-body bag with them. Buy them here! The popular retailer Free People features a pair of pretty suede boots that is undeniably worth a try especially if you appreciate embroidered pieces. Flowerlike embroidery details in the front part of the boots, neat slits at the back and low heels will allow you to pursue your best looks. Due to their go-with-everything design, you will never think long about your ensembles. Buy them here! Gucci famous for its leather high-quality durable shoes, has come to be active and creative again this fall. So you may take a rest assured that your searches for an ideal pair of boots will be a success. Gucci’s famous “horsebits’ seem to be timeless. These beige patent-leather knee boots again come with a horsebit finish, proudly demonstrating that Gucci is on you. 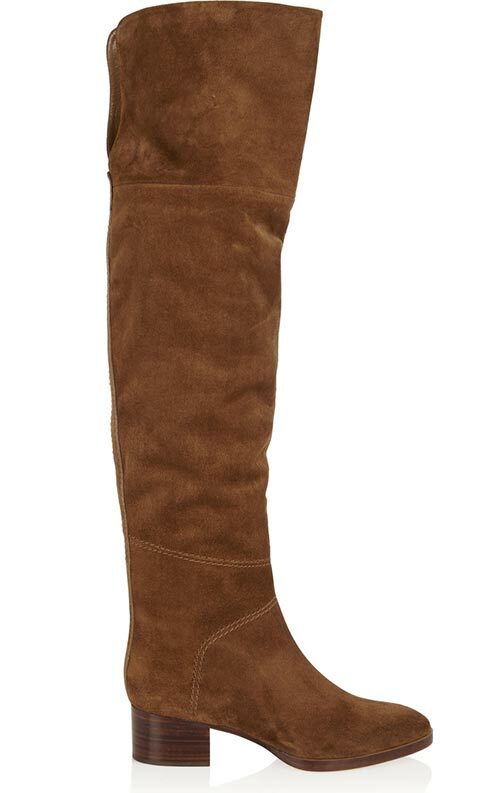 The high-heeled knee boots with square toes will make a perfect pair with dark colored miniskirts or dresses. Buy them here! These dark red leather over-the-knee boots, manufactured with high quality materials imported from Italy, are especially designed for extravagant women, who are adjusted to be always in the center of everybody’s attention. Having an exposed inside zip and low heels, these over-the-knee boots will become your best friends if you have a see-through black dress on you. 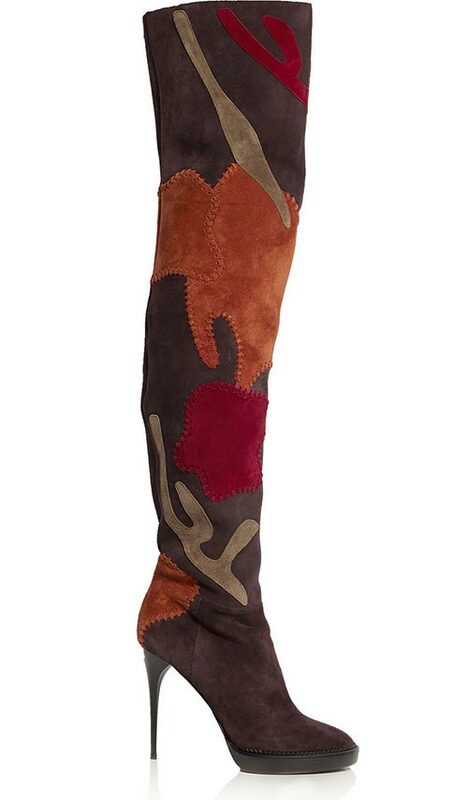 Do not hesitate to add a new pair of these stunning boots to your collection. Buy them here! 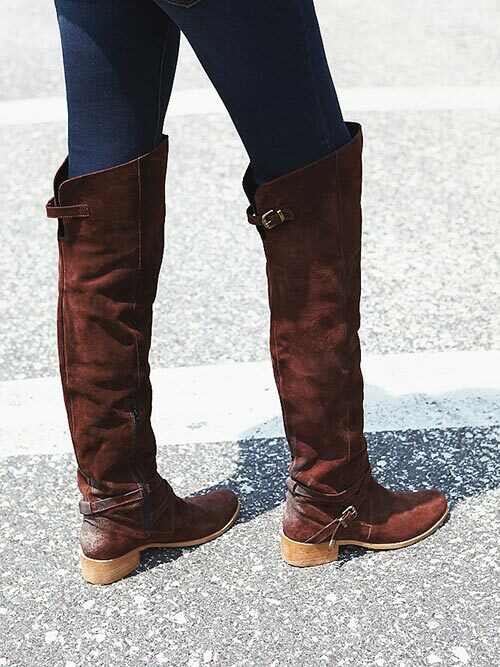 Are you searching for a pair of comfy and casual over-the-knee boots for fall 2015? ASOS has an amazing option for you that’s also pretty affordable. Check out these black suede over-the-knee boots with round toes and a gold-tone detailing on the heel. Whether you match them with denim jeans or midi skirts, be sure that your attire will be perfect while working or just walking around the city. Buy them here! Are you planning to go horse riding with a stylish look? Free People is again here to dazzle you with its stylish offerings. Your dark blue denim jeans topped with a checkered shirt nonchalantly tucked in will complete your horse riding outfit only after you slip into these top-of-the-line suede boots with wooden low heels, accessorized with metal buckles. Buy them here! The British luxury fashion house might be now proud of its new fall 2015 collection named “Patchwork, Prints and Patterns’. The collection features a range of printed and patterned pieces from trench coats to scarves and bags, but also killer boots. These Burberry over-the-knit suede boots are what we consider an embodiment of finely detailed patchwork. Appliqued with three-color patches, these slim-heeled boots will never let you down at a luxurious banquette. Buy them here! Here is another option for your everyday life activities! These black-toned soft leather flat boots with an easy back zip and pointed toes will match your high-street outfits, turning you into a girl, whose style is wished to be copied. Buy them here! We are more than sure that with these Paul Andrew fringed knee boots your fresh ’70s outfit is guaranteed to look drop-dead gorgeous. 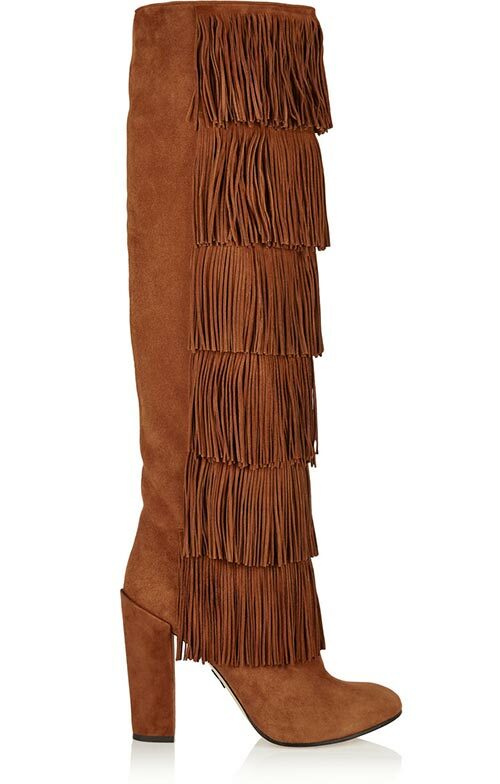 Just look at these exquisitely fringed chestnut boots. A single motion and everyone will notice your boots dancing so nicely. The block-heeled boots promise to never make you tired and disappointed. Buy them here! It is already high time to decide on which of the boots are to be your choice since we are presenting the last boots on our list for fall. The Carlisle rugged over-the-knee boots will definitely easily match the pieces in our wardrobe being super-functional, stylish and comfortable. Stacked wooden heels with an exposed back zip will go well with your favorite slim denim jeans paired with a simple shirt unbuttoned at the neck. The outfit will leave you with your best vintage casual look ever. Buy them here!